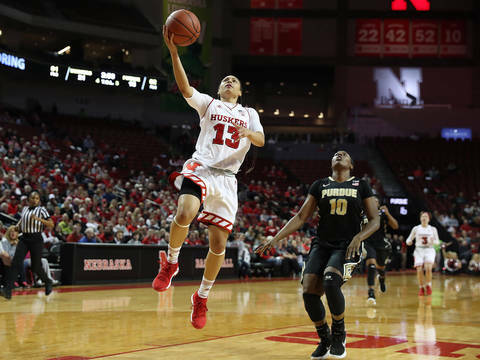 The Nebraska women’s basketball team played its best game of the season by rolling to a 75-51 win over Purdue on Wednesday night at Pinnacle Bank Arena. The Huskers, who improved to 15-6 overall and reached the halfway point of the Big Ten Conference regular season at 6-2, got significant contributions from all 12 players on the roster to register their third consecutive victory. The Big Red also put up an outstanding defensive effort, holding Purdue to just 18 points in the first half. The Boilermakers, who had their own three-game winning streak snapped, slipped to 13-8 overall and 4-3 in the Big Ten. Sophomore Nicea Eliely led the Huskers with 13 points, including a pair of first-half three-pointers, to go along with three rebounds, three assists, a block and a steal for one of the best all-around efforts of her young career. Eliely scored eight points in the second quarter during a 13-2 spurt to close the half and send Nebraska to the locker room with a 29-18 halftime lead. Junior forward Maddie Simon added 12 points and a team-high six rebounds to go along with two assists and two steals for the Huskers. Although Eliely and Simon were the only two Huskers in double figures, all 12 players scored in the game for Nebraska and 11 Huskers had at least one rebound. Nebraska’s leading scorer on the season, Hannah Whitish, finished with nine points on 4-of-7 shooting to go along with three rebounds and a pair of assists. Freshman center Kate Cain added eight points on 4-of-8 shooting while adding three boards, an assist a steal and a block. Freshman guard Taylor Kissinger scored eight points and notched two blocks of her own off the bench to lead a Husker bench that outscored the Boilermaker bench, 28-2 in the game. But it may have been senior guard Janay Morton that provided the biggest impact in the contest. With the game tied at 16 with just over five minutes left in the first half, starting guard Jasmine Cincore was whistled for her second foul and went to the bench. Morton entered and fueled Nebraska’s 11-0 run to take control in the game. Morton finished with six points and season highs of four assists and three steals in a season-high 15 minutes for the Big Red. Cincore finished with five points, including a late three-pointer, while sophomore guard Bria Stallworth added four points and two assists in solid minutes at point guard off the bench. Sophomore Grace Mitchell provided a pair of back-to-back baskets in the first quarter to turn an 11-8 Purdue lead into a 12-11 Nebraska advantage at the end of the opening quarter. Senior guard Emily Wood capped the night for the Big Red with her three-pointer, Nebraska’s eighth of the game, to seal the victory. In the fourth quarter, Nebraska shot a smoking 73.3 percent (11-15) from the field, including 2-of-3 threes. In the second half, the Huskers shot 59.3 percent (19-32) in the second half, including 6-of-11 threes (.545) after being held to just to just 35.7 percent (10-28) with 2-of-10 threes in the first half. Nebraska’s 75 points were the most allowed by the Boilermakers so far this season in Big Ten play. The Huskers scored 46 points in the second half alone, the most allowed by Purdue in any game this season. Nebraska, which shot a season-best 90 percent (9-10) at the free throw line, was a plus-12 in turnover margin (21-9) against the Boilermakers, and outrebounded Purdue, 32-31. The Huskers, who led 12-11 at the end of the first quarter, built an 11-point halftime lead despite shooting just 35.7 percent (10-28) from the floor, including just 2-for-10 threes, against an always stingy Boilermaker defense. Nebraska did hit 7-of-8 free throws in the first half and outrebounded the Boilermakers 17-16 in the half. The Big Red also dominated the first-half turnover battle, 12-4. Nebraska’s defense held Purdue to just 8-for-23 shooting (.348), including 2-of-6 threes. The Boilermakers did not shoot a free throw in the half. The Huskers return to Big Ten road action on Sunday when they travel to Iowa to complete the two-game regular-season series with Iowa. Tip-off between the Huskers and Hawkeyes at Carver-Hawkeye Arena in Iowa City is set for 2 p.m. Iowa enters the game ranked No. 25 nationally in the USA Today/WBCA Top 25.